This is an extraordinary anthology of chivalric treatises made for the noble Claude de Neufchâtel, identified by his coat of arms. The fourteen finely illuminated texts deal, among others, with chivalric protocol, heraldry and the laws of war in Spain, France, Burgundy, and England. They were likey compiled under the direction of Europe’s most important herald at this time, Gilles Gobet alias Toison d’Or, King of Arms of Maximilian of Austria, Duke of Burgundy. Manuscript in French on vellum. 363 x 253 mm. – 208 leaves. With 1 full-page and 10 half-page miniatures, 63 coats of arms. The quality of the miniatures together with some of unique iconographic details, make this an outstanding codex. In representing the Kings of Jerusalem and France on one throne (f. 1r), in adding the arms of Burgundy (f. 169r), and those of the electors of the Holy Roman Empire (f. 143r), the illuminator closely followed the texts. Maximilian and his wife Mary of Burgundy (d. 1482) are both depicted when conferring the collar of the Order of the Golden Fleece (f. 109r). Claude de Neufchâtel (c. 1449-1505), the patron of this manuscript, received the collar himself in 1491. Because the collar with the Golden Fleece does not decorate his coat of arms, this dates the origin of the codex before 1491. 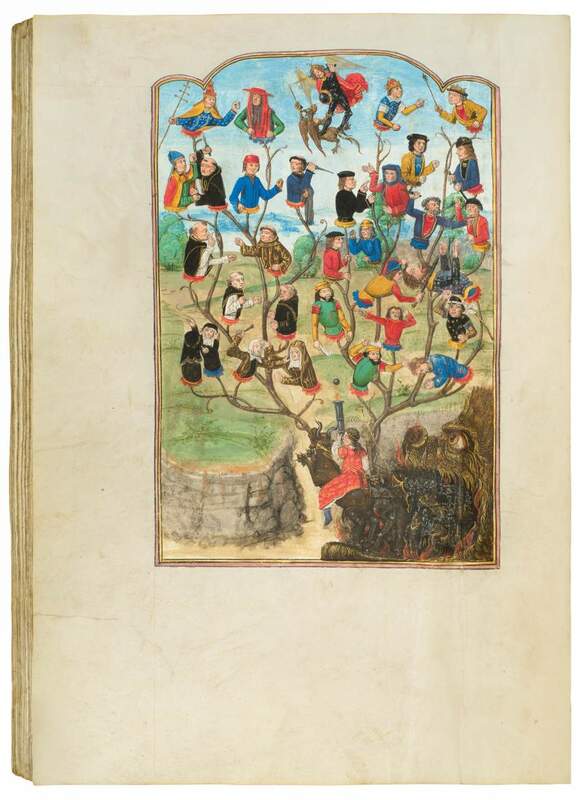 Among the treatises are: Honoré Bovet (1340-c. 1410), L’arbre des batailles; Diego de Valera (1412-1487? ), Traité de noblesse (French translation by Hugues de Salve); Thomas of Woodstock, Duke of Gloucester, La manière de faire champ à outrance, selon l’ordonnance d’Angleterre; La Table des xij chapittres du blazon darmes (illustrated with 63 coats of arms); and other texts. The present manuscript will stimulate new studies into what might be one of the most important chivalric compilations from the Burgundian-Habsburg era.